The MixVibes VFX Control DJ/VJ system enables you to mix, sync, crossfade your multimedia files (music videos, movies, audio files...) using the intuitive display of a classic DJ booth: 2 channels and a central mixer. The package is an all-in-on turnkey solution including VFX software and an Audio/MIDI controller unit. MixVibes' powerful VFX software not only allows you to play the most popular music and video file formats, but to add exclusive content to your performance. The VFX software enables you to insert text, images and dynamic flash animations on the fly, liven your mix with 20 audio/video effects, broadcast live from external video sources (webcams, camcorders etc.) and manage multiple playlists and file formats : mp4, mpeg, wmv, avi, mov, divx, wav, mp3... (see below for full list). The supplied MIDI controller is designed to be light and mobile. It easily fits in installations such as bars, clubs or restaurants thanks to its 19 inch rack design. It features a built-in soundcard featuring 3 stereo channel outputs: 2 for channel playback, 1 for headphone monitoring. or high precision mixing, the touch-sensitive jogwheels will perfectly adjust the BPM (pitch bend) or scratch your music and video files with no latency. Considering purchasing the MixVibes VFX Control DJ/VJ System? Have questions? Ask people who've recently bought one. Do you own the MixVibes VFX Control DJ/VJ System? Why not write a review based on your experience with it. A nice VFX software and controller good for beginners. This is a good bundle deal and has nice control. Its very good for beginners and I would suggest it to all. 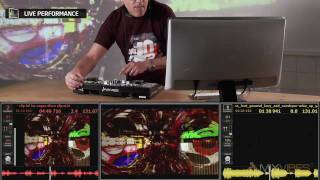 Seen a video for MixVibes VFX Control DJ/VJ System online or have you own video? You will earn 718 loyalty points with this product worth £1.80, when logged in. Check out MixVibes VFX Control DJ/VJ System on DJkit.com!